I love teaching Mindfulness not only as an excellent way to help reduce stress, anxiety and mild mental health issues but also as a means of personal empowerment. Here's the thing: everyone (yes everyone!) has vast inner resources of open, relaxed clarity and wellbeing available to them. Yet often (and indeed most of the time) people don't realise this resource for wellbeing is there, waiting to be tapped into. I introduce people to glimpses of this source of composure and clarity and help them integrate it into their daily lives. "Keeping one's consciousness alive to the present reality"- Thich Nhat Hahn, Zen teacher. Mindfulness is a state of mind in which we pay attention to the here and now, whilst suspending judgement, allowing things to be just as they are. Cultivating this way of paying attention enables the mind to settle and return to a natural state of openness and balance. It can be developed through exercises such as focusing attention on the body or the breath. The practice originates in ancient traditions such as Buddhism and Taoism, yet today it is taught as a contemporary secular practice verified by scientific research. Why bother with this ? Mindfulness helps us become more attentive and so less distracted and emotionally impulsive. The opposite of Mindfulness is 'Mindlessness': being in a state of distraction, denial, of reactive, unconscious behaviour. This not only makes us unproductive but it also makes us unhappy and prone to suffer. A study by psychologists at Harvard University has shown a high correlation between being focused on something and having a happy state of mind. Quite simply Mindfulness practice is good for our Mental Health! It counters stress, anxiety and depression. It helps develop resilience, wellbeing and focus. In the classes I give I often hear people say it has helped them to be more aware of themselves. Rather than being driven by their impulses they now have an awareness that gives them greater freedom to choose how they want to react. On numerous occasions participants have reported being able to sleep better at night or a sense of relief from endless internal chatter. Some report a greater sense of connection with others and of appreciation for the world around them. Mindfulness is a straightforward practice yet it's important to find a trainer who has experience, who understands how to cultivate a truly healthy practice. I have practiced for over 24 years including 10 years of traditional training as a Buddhist monk. Since returning to London, I sought and found effective methods to integrate my knowledge amidst frenzied city life. I have now refined and distilled my expertise into accesible practices that are easy to grasp. I make Mindfulness simple. I teach using direct steps and everyday tips that combine conventional mindfulness practices and creative techniques which help people to access calm, clarity and insight with relative ease. Participants are pleasantly surprised at the difference this makes. 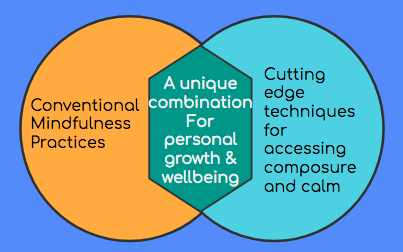 Mindfulness sessions and courses in the Workplace - see below. Clients have included Govt Department of Energy and Climate Change, Procter and Gamble and Barclays Investment Bank. I have taught extensively for the City of London's local government Mental Health Community Learning pilot in five London boroughs. "The 6 week mindfulness course was of huge benefit to me. I run my own business and have numerous thoughts whirring around in my head constantly. I'd often turn up feeling a but frazzled with my head all over the place but every time I did the course I'd come out feeling so relaxed... I learned so many new ways of looking at things and myself which were all positive and I'd recommend it to anyone either running a business or in general feels like everything is getting on top of them. Andy was very personable and taught us these tips with a very pragmatic approach... Overall a very worthwhile experience." "Andy has a fantastically realistic way of helping you incorporate the principles around meditation and mindfulness into normal everyday life. I had been along to a few half hour sessions with him, but spending a day exploring different ways of working with it and discussing it with Andy and as a group, really put it all into perspective. Basically I wanted to endorse Andy and say I'd highly recommend!!" "I like the format - theory, practice, discussion... It was more than amazing. I'm so astounded by the effects."